@greatgrampops - #dearGreatGrandchild yesterday I took a little time out of my day to test ride a bike known as the Road King with the guys at @harley_davidson_tyger_valley - first of all, I kinda went in there without giving an indication to what I do, but contrary to my last Harley dealer experience, these guys completely turned the table from an experience point of view. I felt like I was being looked after and they’d have time for anyone, especially a dude who doesn’t exactly look like a Harley rider… Now to the bike… I was overwhelmed by the size and weight of this guy, but as soon as I got moving, I felt like I was gliding along the road like I owned it and I get the idea that might be where the name came from. I could see myself riding across the States with this bike and I think that I may have just added a new thing to my bucket list. Thank you again to the guys at @harley_davidson_tyger_valley for not “judging the book” and giving me the chance to ride this beautiful machine. "Awesome store with smiles all round, very helpful staff and a wide selection of accessories to choose from. Thumbs up". “I wish I had bought a Harley years ago! So far all my experience with Harley members, be it the salesman at Tyger Valley, the receptionist, the chrome specialist, the partners, the mechanics, the H.O.G. committee members and normal members - has been very positive and a real pleasure – we feel like part of the family!" 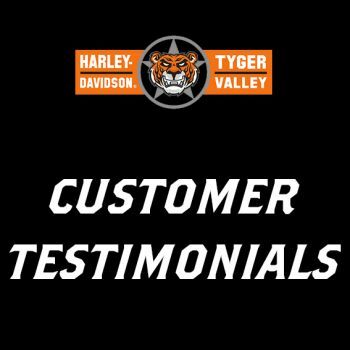 "Thanks Joe and your technical team for the excellent service & work on my CVO Ultra Limited; you guys always give your clients more than what they expect to get ...Kudos for you!" "I always feel welcome here. Even when I just come here to dream about the next bike. I even get coffee and a smile. Thanks, to all at Tygervalley Harley".